M266 | 923 m. | 3028 ft.
May 2009 was the wettest hiking season in Scotland that I ever had the privilege of experiencing. This tour proved to be no different from the average squishy, slithering, sleety, soaking standard. Having set our mind on ticking off the four eastern Munros of the Fannaichs we approached the hills from the parking on the A835 between Loch Droma and Loch Glascarnoch which is at the bridge over the Abhainn an Torrain Duibh. On the left bank of the Abhainn we followed the bends of the burn which carried a lot (!) of water indeed. The going was good and the path was sort of dry. Soon we reached the confluence of the Allt an Loch Sgeirich and the Abhainn a’Ghiubhais Li, crossed the first and continued our tramp along the left bank of the latter. We did not (!) use the bridge but climbed further on the deteriorating path. Higher up the burn we managed to cross it and headed over heathery terrain up the gentle slopes of Meallan Bhuide. Well, close to the rounded summit of this hillock the rain caught us and ended the short intermezzo of two hours walking without water coming down (my feet were soaked anyway, so hey, what difference does it make?). Loch Gorm came into view. It nestled nicely between the crags of Meall Gorm and the corrie headwall which lay ahead. We climbed into the hanging corrie above the loch, veered in a south easterly direction and came to the summit slopes of An Coileachan. At the summit sleet was coming down so the short rest was rather uncomfortable. From this first Munro we turned north-west, crossed the area at the head of the corrie of ascent and climbed the grassy slopes, interspersed with rocks, which lead to the very flat ridge of Meall Gorm. The wind now caught us, things became considerably colder and the visibility dropped to 50 meters. At a stone shelter shortly before the summit we added an additional layer of warmer fleece in driving rain. Then the summit appeared, the cairn was touched and we continued immediately on the good path, not without being almost blown over once or twice by the gale. On this ridge we met another group of hillwalking lunatics (Sorry lads! :-))) who did the same tour counter-clockwise. Soon after the top of Meall nan Peithrean the 200m climb to the summit of Sgurr Mor began. Frank raced ahead and I had to hurry not to loose contact. Having already bagged this Munro a few years earlier my motivation only sufficed for plodding on. At the large cairn we took a short summit break and then retraced our steps to where the side ridge leading to Beinn Liath Mhor Fannaich branches off. The steep descent down this side ridge was treacherous since a thin layer of slushy snow covered the grass and the path. Soon the broad ridge made for easy walking. We passed the hunters’ shelter, got to the bouldery west face of Beinn Liath Mhor Fannaich and followed the path contouring around the hill to its north side. From there we climbed the last 100m to the summit of our fourth Munro. By now, we both were quite exhausted. But since the car was another seven or eight kilometres off and the weather did not improve we hastened our retreat. Down the very rocky south ridge of Beinn Liath Mhor Fannaich we headed towards the gentler slopes of Creag Dubh Fannaich. From this subsidiary top we struck a more or less direct line towards the confluence of the Allt an Loch Sgeirich and the Abhainn a’Ghiubhais Li. The terrain got flatter and with all the water that had come down and was still falling from the sky we now experienced the disintegration of gentle heathery slopes into pools, rivulets, streams on grass and mossy water traps. One of the wettest pieces of land in Scotland we have ever seen. With some difficulty we crossed the Allt an Loch Sgeirich and reached the path along the Abhainn an Torrain Duibh, which had beed transformed into a raging torrent of peaty water with waterfalls and all. Very nice to the eye but our minds were set on autopilot by now. Then, after seemingly countless jumps over pools and countless bends of the river we finally saw the parking and our car. Soaked and very, very tired we reached the road, peeled off some of the wet layers of clothing and headed off towards our warm and cosy cottage in Letters on the shore of Loch Broom. This was not a great hike, there were no marvelous views, but in hindsight it feels like we did a decent job on a ghastly day in the hills. Description These two hills are at the south-eastern end of the Fannaichs, overlooking the east end of Loch Fannich. A broad ridge connects An Coileachan to Meall Gorm, and this ridge continues north-west to Sgurr Mor and the other mountains of the range. On the north side of this ridge there are several high corries holding lochans which drain north-east down the Abhainn a' Ghiubhais Li to Loch Glascarnoch. An Coileachan is a prominent hill with a fine corrie above the end of Loch Fannich.On the south side of the range the private road to Fannich Lodge is not accessible for cars, so the best approach to these hills is from the north. Leave the A835 road near the head of Loch Glascarnoch and walk up a rough path beside the Abhainn an Torrain Duibh and its tributary the Abhainn a' Ghiubhais Li for about 5 kilometres. Cross the stream to bear south over Meallan Buidhe and continue up the north ridge of An Coileachan. Traverse north then north-west along the broad and fairly level ridge past a stone hut to reach Meall Gorm. 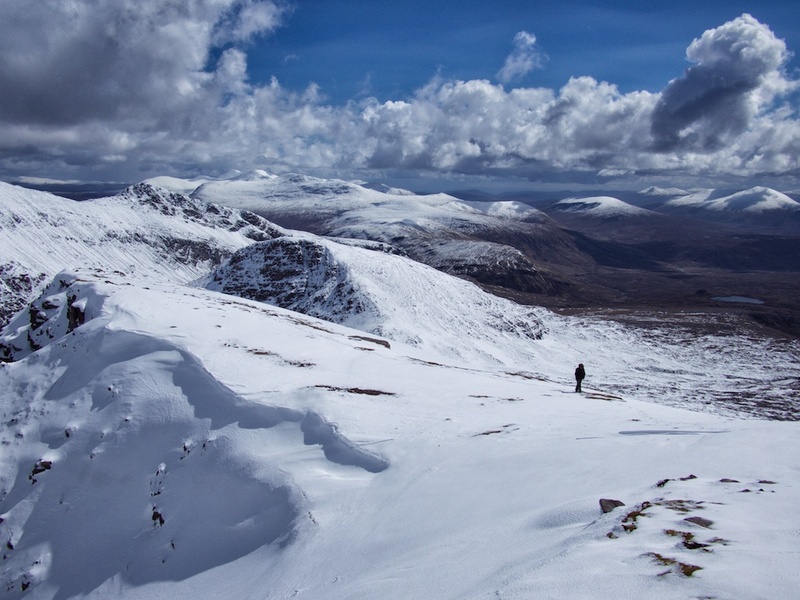 Rather than descending the steep north side of this hill, it is better to return along the ridge to the col just before An Coileachan and descend north-east from there to rejoin the uphill route.